Vanee Deluxe Beef Stew has tender beef dices, coin-sliced carrots, garden peas, celery and fresh diced potatoes in a rich beef gravy. Perfect in a bread bowl, or as an ingredient for pot pie or soup. 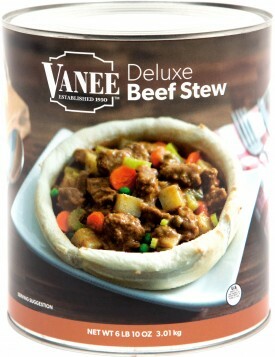 Vanee Deluxe Beef Stew frees up valuable freezer space by being shelf-stable, is lower in sodium than national brands, has beef as its first ingredient, and is heat-and-serve for ultimate back-of-house simplicity. Each 106 oz. can has 13 one-cup servings, for 78 total servings in a case. 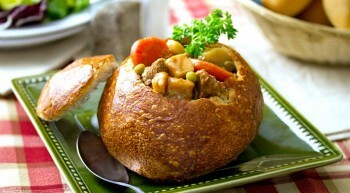 Serve 8 oz in a bread bowl, over biscuits, or use in pot pie filling or soup. 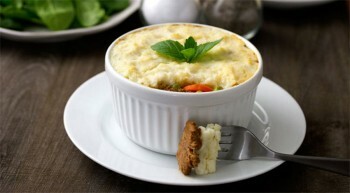 Beef, Beef Stock, Potatoes, Carrots, Water, Green Peas, Food Starch - Modified, Celery, Contains less than 2% of Calcium Lactate, Caramel Color, Disodium Guanylate, Disodium Inosinate, Flavoring (Contains Canola Oil), Grill Flavor (Contains Sunflower Oil), Lactic Acid, Maltodextrin, Onion Powder, Paprika, Salt, Sugar, Yeast Extract.